AviancaTaca Holding and its subsidiaries reported an increase of 12.9% in passenger numbers compared to 2011. During 2012, AviancaTaca Holding S.A. recorded net profit of COP$351,684 million, up 73.9% compared to 2011. In 2012 AviancaTaca Holding S.A. continued work on expanding its network of routes and creating new air services for travelers flying to and from the Americas and Europe. According to AviancaTaca's CEO, Fabio Villegas: "Following the integration of Avianca and TACA operations the Company has launched 46 new routes, and over the last year has emphasized connectivity between high demand points in the local markets of Colombia, Peru and Central America, and throughout the Americas and the Caribbean. This expansion process is taking place in parallel with the renewal of the aircraft fleet and the development of an intensive campaign to further improve the internal service culture." As a result of the increase in seat capacity, flight services to key destinations and also an improvement in service standards, AviancaTaca Holding and its subsidiaries transported 23.1million passengers in 2012, an increase of 12.9% compared to 2011. Between January and December 2012 the number of travelers transported in markets within Colombia, Peru and Ecuador was 13,255,502, up 18.5% compared to 2011. The number of passengers transported by the Company on international routes was 9,837,031, an increase of 6.1% compared to 2011. Between January and December 2012, Avianca, TACA and its subsidiaries recorded an operating income of USD4.254 million, up 11,2% from 2011. Excluding the extraordinary adjustments in 2011 and 2012, operating income grew 8,3% Operating profit for the year was US$281.965. EBITDAR (earnings before interest, tax, depreciation, amortization and aircraft leasing payments) for 2012 was USD$ 737.5 million and net profit increased 78,7% higher than in the same period of 2011. Consistent with an increase of 10.3% in ASK capacity (seats available per kilometer flown), passenger traffic in RPK (passenger revenue per kilometer flown) increased by 10.3%. The average load factor was 79.6%. Fleet renewal: During 2012 the Company incorporated 14 new jet aircraft: two Airbus A330s, four Airbus A319, seven Airbus A320 and one Airbus A330F exclusively for cargo. It also announced the firm order for 15 ATR 72-600 aircraft and rights to purchase 15 more, which will be assigned to cover regional routes within Colombia and short and medium-haul markets in Central America. During 2012 the number of flight services offered by the company increased on more than 20 routes, averaging 5,000 flights per week by the end of the year to more than 110 destinations in Latin America and the world. Avianca and TACA in Star Alliance: In 2012 the airlines were officially accepted into the global network of the world's most important airlines. Since then Avianca and TACA passengers have had access to 21,500 flights a day operated by the 28 member airlines of the Alliance from 1,356 airports in 193 countries around the world, enabling them to enjoy the highest quality services and exclusive personalized attention (for LifeMiles members) in 990 lounges worldwide. Codeshare: In 2012, Avianca and TACA had codeshare agreements with 11 international airlines, offering extensive coverage in countries outside Latin America. We highlight the success of connecting flights to points in the United States and Canada, Mexico, the Caribbean, Brazil and Europe in particular. 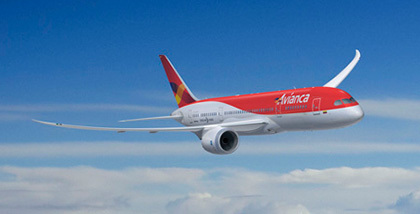 Avianca, the single brand for the integrated airlines of AviancaTaca Holding S.A.: As announced in 2012, Avianca will be adopted as the unique commercial brand for the airlines of the group. Thus, Aerovías del Continente Americano S.A. Avianca and Tampa Cargo S.A., Aerolíneas Galápagos, TACA Internacional Airlines S.A, LACSA, TACA Perú and Aviateca will soon be beginning a new era of excellence in service under this single brand name. Corporate Social Responsibility & Sustainability: In 2012, thanks to the support and contribution of thousands of members of the LifeMiles frequent flyer program, the Miles Bank benefited 389 low income people requiring medical assistance. This program now has partners in the hubs where the airlines of the group operate and has become an interagency program favoring high risk communities in Latin America. Meanwhile, the company continued with the process of renewal, simplification and modernization of the fleet by adding 14 new Airbus aircraft equipped with environmentally friendly technology and improvements in the combustion chambers, thereby reducing CO2 emissions and NOx in more than 20%. Similarly progress was also made in the standardization and implementation of procedures to protect the planet, using the guidelines established by local legislation, ISO 14001, IFC, ISAGO and IOSA. We highlight the implementation of a training plan that seeks the proper processing of waste, greenhouse gases, chemicals, and potable water, with the goal of creating an environmentally friendly culture among employees.